Flora Fong, Ernesto García Peña & Gilberto Frometa are representatives of the generation of artists who established their professional career as artists and art professors in the 60’s, and as such revolutionized and formed the aesthetics of the new Cuban society. 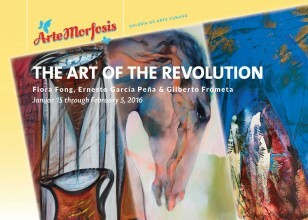 The gallery ArteMorfosis celebrated it’s opening year in 2015 with solo exhibitions of these artists because they embody the taste of the Cuban Society. Their work forms part of the collection of contemporary cuban art of the ‘Museo Nacional de Bellas Artes de La Habana’, and is displayed in all art fairs in Cuba and – most importantly – their work hangs on the walls of many Cuban homes; hardly a household that does not display an edition or print of these artists – they are true ambassadors of Cuban visual taste. The exhibition shows recent works of Flora, Ernesto and Gilberto and includes a unique highlight from each one: Inspired by their exhibition in Zurich, they created a painting that is displayed for the fist time in this exhibition: Flora shows ‘Primavera en Zurich’ (Spring in Zurich), Ernesto displays ‘La Gran Marcha’ (The Great March) and Gilberto celebrates the successful termination of his exhibition with ‘When Autumn Ends’. As diversified the art of these three Cuban Maestros is, ArteMorfosis shows what unites them: Caribbean colors, tropical light, and Cuban ‘joie de vivre’.